Step 1. Figure out your earnings and net worth. The idea is to figure out how much money has flowed into and out of your life. Figure out your current cash flow. Figure out your real hourly wage by adding into work hours all the work-related time outside the office (commuting, working from home, cost of meals, etc). Step 3. Create a table of income and expenses in broad categories. Convert the dollars spent in each category into “hours of life energy” spent. Think of purchases and other expenses in terms of the amount of life given up to earn the needed money. Did I receive fulfillment, satisfaction, and value in proportion to life energy spent? Is life energy spending in alignment with my values and purpose? How might this expenditure change if I didn’t have to work for a living? These questions can transform your life and help you set the foundation for your life transformation. Step 5. Create a chart plotting total monthly income and total monthly expenses, and put it somewhere you’ll see it every day. Step 6. Value life energy by minimizing spending. Beyond a certain point on the fulfillment curve, spending more will bring less fulfillment, so you’re not giving up happiness. Step 7. Value life energy by maximizing real income. Work and wages aren’t the same; wages are simply the money you trade your life energy for. Step 8. Post your monthly investment income on a wall chart. As the monthly investment income curves upward, at some point, it’ll cross over the monthly expenses line. This crossover point represents the time when you can stop working for pay. You only need to work for pay for a finite period of time—focus on that goal and make that period of time as short as possible. When you no longer need to work for pay, you are Financially Independent. Step 9. Invest your capital to provide safe investment income regardless of your employment status, with 6 months of a cash cushion. Surplus funds can be reinvested, donated, or otherwise used. Get acquainted with investment vehicles to secure your financial independence. While Joe Dominguez focuses solely on buying U.S. Treasuries, it would probably be wisest to pursue a balanced investment strategy with an equity component. As with The Millionaire Next Door, the emphasis is on “playing defense” or on controlling spending. 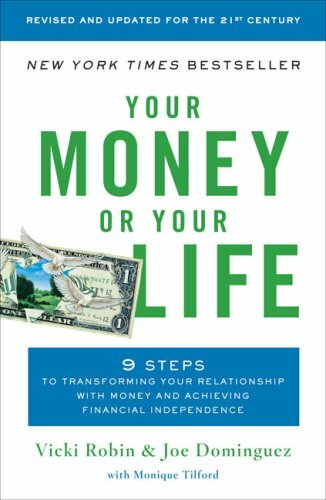 What Your Money or Your Life does is to put controlling spending into a larger context of maximizing fulfillment, minimizing waste, and pursuing a higher purpose.